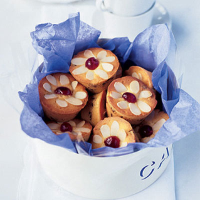 We've made individual cherry and almond cakes rather than a large one, so they're easy to serve at an Easter tea. They're also ideal as Mother's Day or Easter gifts, and they keep for a couple of days in a tin. Find seasonal cake recipes at waitrose.com/recipes. Preheat the oven to 150°C, gas mark 2. Generously grease 20 holes of 2 x 12-hole non-stick muffin tins. Cut the butter and marzipan into cubes and place in a large mixing bowl with the caster sugar. Beat with an electric whisk until pale, fluffy and completely combined. Sieve the flour into the marzipan mixture, add the eggs and beat together. Stir in the milk and almond extract. The cake mixture should have a soft dropping consistency. Wash the syrup from the cherries, pat dry with kitchen roll, then cut in half. Reserve 20 of the halves and stir the remaining cherries, together with the sultanas, into the cake mixture. Spoon the mixture evenly into the 20 holes in the muffin tins. Arrange the flaked almonds on top of each cake and place one of the reserved cherry halves in the centre to make a flower pattern. Bake in the preheated oven for 20–25 minutes, or until the cakes are light golden, and a skewer comes out clean when inserted into the centre. For a large cake, make the same mixture but bake in a greased, lined 20cm round tin for about 1 hour 30 minutes, or until a skewer comes out clean when inserted into the centre. Lightly cover the top with foil if it starts to get too dark.